Gin, pineapple juice, a little lime, and your favorite sparkling water make the perfect summer cocktail. 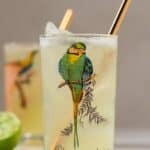 This Pineapple Gin Cooler Cocktail recipe is easy, refreshing, and has a retro twist. Your BBQ guests will love it! Combine all ingredients except sparkling water into a cocktail shaker. Fill the shaker with ice and shake vigorously! Evenly divide cocktail between two tumblers filled with ice and top with your favorite sparkling water. Serve with more lime wedges and cute paper straws! If you plan on serving this cocktail as a punch, multiply the recipe as needed, combine all ingredients in a large retro punch bowl, and serve with ice on the side!